The effects of wind on long distance running have been discussed on this blog previously, particularly on marathons. Now with the approach of the World Athletics Championships, I thought I would look at the effects of wind on sprinting. I will begin with my own experiences – when I was a teenager I was an enthusiastic 100m and 200m runner. I remember turning up to local athletics competitions with my fingers crossed that there would be a tailwind rather than a headwind in the pursuit of a personal best . In my own experience the wind had an obvious effect, but can we quantify the effect of the wind in a sprint race? What does the effect mean in general? The International Association of Athletics Federations (IAAF) acknowledges the effect of a tailwind by setting strict criteria – a time run in a tailwind greater than 2 ms-1 cannot count for record purposes. The effects of wind on the time for a 100 m sprint has been discussed in journal papers and at conferences and they generally agree that a tailwind of 2ms-1 improves a time by about 0.1 s. In the world of sprinting this is vast – the first 6 athletes across the line in the 2003 World Championship 100 final were covered by less than this time. However a 2ms-1 tailwind is a light breeze, only just above walking pace. The effect of various wind speeds on a 100m time of 10.00 s is shown in table 1 (calculated using an online model). Table 1. The effect of various wind speeds on a 100m time of 10.00 s.
Negative wind values are headwinds. Table 1 shows that the increase in time due to a headwind is more than the equivalent decrease in time due to a corresponding tailwind. This agrees with the previous blog article on distance running in the wind by Prof. Steve Haake. Let’s consider the list of the top 23 (legal) 100m times shown on the left of Table 2. Usain Bolt sits at the top of the list, with much of the top 23 times set by the same familiar names. One thing to note is the fact that the majority of the times were run with a tailwind. In order to account for wind speed I used a model to correct all times as if they were run with a wind speed of 0 ms-1. The result of applying this correction to this list is shown on the right of Table 2. Table 2. The top 23 100 m times in history on the left and corrected for wind and altitude on the right. The green highlighted times have moved up the list and the red highlighted times have moved down. This shows a great deal of movement in the top 23 100 m times, with the average movement throughout the list being above 5 places. Indeed the Pearson correlation coefficient of the rankings before and after correction is 0.29, indicating only a weak correlation. One notable movement up the list is Maurice Greene’s best time, jumping into the top 10 from equal 20th. 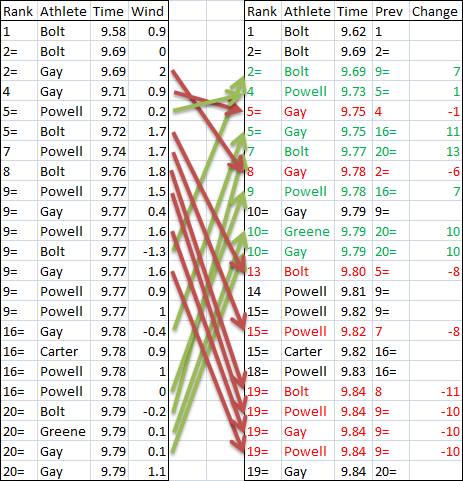 Also the corrected performances indicate that Powell is the 2nd fastest athlete rather than Gay. This shows it is not always reliable to comparer athletes on times alone. With the upcoming World Championships, comparing the contenders in the sprints using best times run this year may not be so useful in determining the favourite; the fastest time set may not be the best performance. There is one consistency between the lists in Table 2 – Usain bolt still sits comfortably on top. The world record is 9.58 seconds, set with a 0.9 ms-1 tailwind, and this is still the best performance after the times are corrected. The model also suggests that if this performance was carried out with a ‘perfect’ 2 ms-1 tailwind, the time could have been as fast as 9.53 s.
While on the topic of sprinting in the wind the 200 m cannot be ignored. Usain Bolt has the 1st, 2nd and 4th fastest 200 m times in history, all of them run into a headwind. The world record of 19.19 s was run into a headwind of 0.3 ms-1. If this performance was carried out with a ‘perfect’ 2 ms-1 tailwind, the 200 m model suggests this time could have been as fast as 19.05, very close to the 19 second barrier. Even taking the effects of wind on sprinting performance, Usain Bolt has set some remarkable records that are clearly ahead of the pack. so are you basically saying that bolts not as quick as he or the rest of the world would like to think? how about doing this for something like javelin or longjump, something which could 100% percent be affected by the change in wind direction and speed? just a suggestion! 1) We have to remember these findings are based on a model, with associated limitations. Therefore, it is difficult to compare performances at different events precisely. However, as you mentioned this type of analysis can be used to rank performances more precisely allowing rankings for upcoming events to be made to a higher level of accuracy. I imagine bookies would be pretty interested in this! 2) Do you think we could ever see athletes engineering performance i.e. waiting for the perfect conditions to run a PB purely for personal satisfaction? This could be compared to a surfer awaiting the elusive perfect wave for example. 1) The model gives a bit more information on the standard of performance but does have limitations. I think one of the main limitations is relying on the the wind readings themselves – how accurate are the wind readings? 2) Field event athletes already use the conditions to engineer performance – with a 1-2 minute window to carry out the throw or jump they can wait for the wind to be most favourable. Track athletes have to run when the starter brings them to their marks and indeed can be warned for holding up the start, so in track events this is less likely to happen.